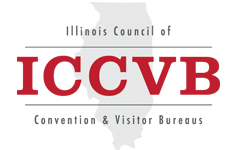 The Illinois Council of Convention and Visitor Bureaus engaged Tourism Economics to conduct an independent analysis of state tourism promotion funding in Illinois and to analyze the potential impacts to the state, and local economies, of hypothetical long-term reductions to state tourism promotion funding, also referred to as destination promotion funding. Tourism Economics’ results are summarized as follows. With a Partial Funding Cut, over a four-year period, Illinois is expected to lose $2.3 billion of visitor spending, an average of almost 4,600 jobs, over $850 million of labor income, and $127 million of state taxes. The estimated net state tax loss is $73 million ($127 million of lost state tax revenue, less $54 million of budget savings). When local taxes are included, the net state and local tax loss increases to $143 million. State and local governments would have to tax each household an additional $30 over this period to raise an equivalent amount of revenue. With a Full Funding Cut, over a four-year period, Illinois is expected to lose $11.3 billion of visitor spending, an average of more than 22,800 jobs, almost $4.3 billion of labor income, and $635 million of state taxes. The estimated net state tax loss is $367 million. When local taxes are included, the net state and local tax loss is $713 million. State and local governments would have to tax each household an additional $149 over this period to raise an equivalent amount of revenue. 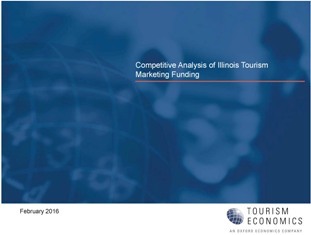 For a complete copy of Competitive Analysis of Illinois Tourism Marketing Funding in an Adobe PDF format, please select this link. Select this link for a press release highlighting the study. Select this link to download a useful, two-page fact sheet that details the value of investing in tourism and explains what's at risk with funding cut.